Made this mostly for myself but decided to share it with you unfortunate large resolution monitor owners. Feel free to redistribute wherever you like. Only thing I ask is that you don't claim that you made it yourself (since that would be lying and lying is generally looked down upon. ;P ). Anyways, Stella (left) and Noctis (center and right). Both from Final Fantasy Versus XIII. A side note: Depending on your screen brightness setting, this may or may not come out darker/lighter than originally intended. For me I can see everything as they're intended to be (well duh, I made it. lol.) and it appears crisp and clean on my HD 22" which is set on it's default settings. If it doesn't for you, I'm sorry but there's nothing I can do. I think some parts are too dark.. But the composition is very good..
this ff13 wallpaper looks nice. Very nice. 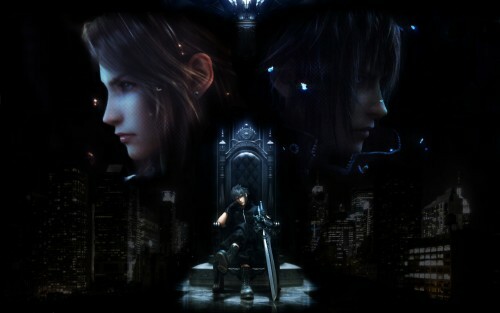 Noctis surely look majestic there. Love it. XD The atmosphere is really cool. Love the city BG. Tnx for sharing! Thanks for this splendit wallie. Thanks for this splendit wallpapers.love it? wow wow~! cant wait for it to be released~!